We were honored that Omar Pérez from the Junta de Castilla y León’s London office came along and was kind enough to say that he really enjoyed the tasting. It was a great trip, full of new wines and experiences and I wanted to reflect that in the tasting, judging by the attendee’s reactions on the night – I succeeded. We all enjoyed the evening and the wines were a surprise to many of the people there. They tried wines from regions and grape varieties that they had never heard of before. I had been struck by the variety of wine available from the Province of Castilla y León. With the incredible fame and popularity of Rioja it is easy for consumers to regard Castlle as a backwater, but this is very far from the truth, Castilla y León is the historic hub of Spain. It is where the reconquest of the Iberian Peninsula from the Moors seriously started, so Spain is a sort of enlarged Castille, up to a point. Indeed there is no such language as Spanish, it is properly called Castillian. Wine has always been important here, the land is steeped in it and they styles are often much more traditional than Rioja as the influences have, until recently, always been Spanish rather than from outside. I say recently because it is undeniable that some of the wines I tasted were designed by wine makers keen to earn Parker points and to make wines in that blockbuster style with rather more new oak than anything else. I was thrilled by what seemed to be more honest and traditional wines, that were really well made and the tasting concentrated on these. Three of the wines are not available in the UK and I had to get them sent over from Spain especially for the event. Thank you all for helping to make that possible. 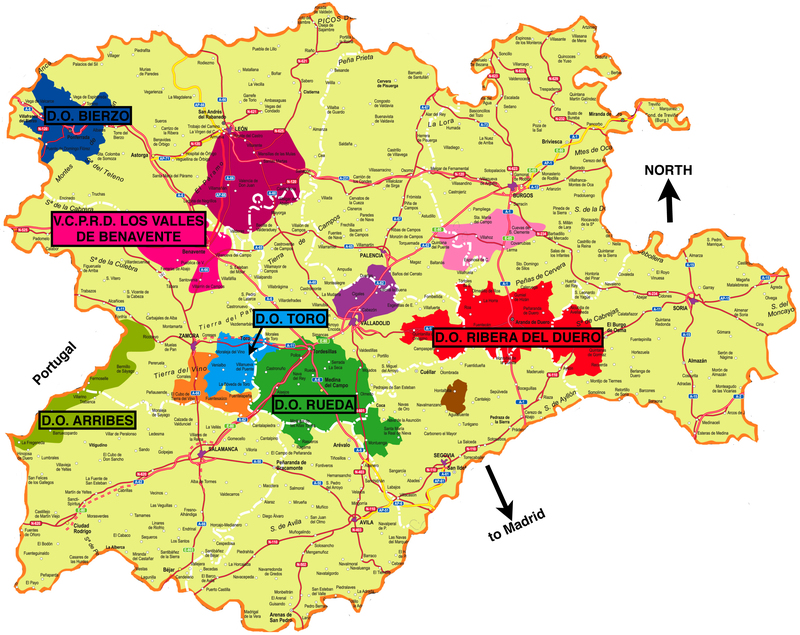 I am on record (here) as saying how much I appreciate Verdejo from the Rueda region, and other parts of Castilla y León. Some examples are richer than others and some are more mineral, I deliberately chose a very bright and rich version for this tasting. Centellito is made by Bodegas Alvarez y Diez and offers the classic citrus and herbal aroma of Verdejo together with a soft, fresh and succulently textured palate of nectarine, pithy grapefruit and passionfruit. A very good and enjoyable dry white wine. Bierzo, the north western corner of Castlilla, was once a part of Galicia and shares many common traditions, including grape varieties. It is a beautiful and welcoming place and I highly recommend watching a sunset from Las Medulas Cultural Landscape, which is an extraordinary landscape created by once serving as the largest gold mining area in the Roman Empire, and is now a Unesco World Heritage site. This Godello has a lovely balance of acidity and richness that makes the wine clean and fresh with floral, herbal and citrus aromas leading to a smooth, supple palate and a crisp finish. This was a greatly appreciated wine, with it and the Godello being the joint favourite white. Like Verdejo, Malvasia is a grape variety that oxidises easily, so we have had to wait for modern reductive techniques to enable us to see its true capabilities. This might well explain why these wine regions shied away from white wines in the past, except for Sherry-like styles and concentrated on reds instead – with only rosés for when refreshment was needed. The beautiful La Setera winery is descirbed in more detail here. Creamy and honeyed nose with a fresh herb feel and nutty notes. Mouth-filling with a little fresh citrussy lemon pith and lemon peel acidity with a full and viscous texture. Really characterful with a tangy grapefruit finish, quite long and balanced. A terrific dry white wine, one of the very best of our trip and truly memorable. This was an exciting first for most people, a pure Juan Garcia varietal wine, which is a grape variety that only grows in this little area right by the Portuguese border – indeed the Duero/Douro river is the frontier here. At times there are characters reminiscent of a rich Gamay or a Cabernet Franc in Jaun Garcia, but this example also has a ripeness that balances the slight dusty, savoury and mineral characters of the grape giving it a roundness and plumpness of red fruit that is very appealing. VCPRD is a quality level broadly equivalent to VDQS in France, so a step down, in theory, from DO or AC. However in practice this is a very accomplished wine. I loved visiting this place, it has belonged to the Otero family since 1906 and where once it was in countryside the winery is now in a busy town street – luckily the vineyards are a little way away in the countryside. As well as being nice people they entertained us beautifully with my favourite of all the winery lunches – a simple, but delicious spread of various empanadas, salad, jamon, chorizos and cheeses. Their wines were lovely too, honest and enjoyable, well made, stylishly packaged and remarkable value for money, – they make super rosés and whites too, well worth finding if you are in the area. Sadly, to date they remain unavailable in the UK, so I would like to thank them for making some bottles available for the tasting. This wine is medium-bodied and enticing with a rounded palate of gentle blackberry, a touch of spice, a fresh point of acidity and supple tannins with well balanced and integrated oak on the balanced finish. This made many friends at the tasting, such a shame that it is not available. Another wine that impressed, this time I have not visited the winery, but I wanted to show a red Bierzo that was on the generous side and although I did try enjoyable examples out there, none quite have the richness of this. Martin Sarmiento is made by the Bierzo offshoot of the Martin Codax winery in Rias Baixas, Galicia. They came here to grow Mencia, rather than a Galician region precisely because Bierzo’s climate can coax more richness and weight out of Mencia. This splendid grape is said by some to be a relative of Cabernet Franc (yet another!) and indeed it does have some characteristics in common. Martin Sarmiento Mencia however was thought by many, me included, to have a more Burgundian or rich Pinot Noir feel, even an aged Moulin-à-Vent feel. Yes there are savoury notes and an earthy feel, but the black cherry and plum fruit make it quite succulent and round. Available from Waitrose and Majestic Wine Warehouse: prices vary. On my trip I only saw this magnificent estate from afar, but even at a distance it impressed. It is a stunning castle like edifice dating back to 1328, just as you turn down the little road to La Setera, so it is in Arribes del Duero – hence the name of the range ‘Natural Reserve’ as they are in a natural park – but they choose not to label any except their top wines as DO Arribes. In part this is because they use a wide range of grape varieties, some of which are not traditionally allowed in the region – please do try their excellent Syrah if you have a chance. This is the most commercial, in a good way, of all the wines at the tasting, it is clearly aimed at being a crowd pleaser, but it works. The nose is fragrant and tempting while the palate delivers that round, mellow, silky and savoury character that makes Rioja so popular. It has lovely ripe fruit and good balance with light chalky tannins on the finish. £6.99 per bottle from Majestic Wine Warehouses. Sadly on my trip we did not venture into Toro, but I have been before and really wanted to show an example of their stunning value reds. I have long wondered why Toro wines are so under represented on UK supermarket and wine shop shelves, this example in particular. So I was thrilled to discover that this is no longer the case, in different packaging, and I am sure a subtly different wine too, this wine is now available from Waitrose and Marks and Spencer. This is pure Tinta do Toro, which although it is Tempranillo has evolved separately over time to produce wines with a less savoury character, more red fruit and less earthiness. I think this is a terrific wine, full of character with rich fruit, plenty of alcohol and just a touch of oak to soften and tame those ripe tannins. I let it breathe for 2 hours, it does need it, as this is a lot of wine for the money. For our finale I wanted something special and we got it! I am a great believer in the potential of Ribera del Duero, sadly too often the potential is all I get as many of the actual wines are mean and stringy, lacking elegance and charm. For two years running at the Concour Mondial de Bruxelles competition I have been underwhelmed by the majority of the Ribera del Duero entries. Strangely enough strolling around Valladolid, (which I would recommend as it is lovely place which I enjoyed immensely), the bars sold simple unoaked Ribera del Duero Joven wines, which were very attractive indeed and I wonder why no one brings those into Britain? However the wines that do not disappoint really do not! I could run off a long(ish) list of superb wines from here, but I’ll save them for another day. Spain’s single greatest wine estate, by fame and repute, is here, Vega Sicilia and while I could not squeeze Vega Sicilia Unico or Vega Sicilia Valbuena into the budget I could just run to the third wine in the stable: Alion. Balance, concentration, depth, rich soft fruit characters, rich spice and savoury coffee and mocha characters, elegance and joie de vivre, fine grain tannins on the finish, integrated smoky oak and a lovely complete feel that is both exuberant and fine at the same time. It looks like it could keep forever, but I would happily drink it now, it is utterly delicious. Around £50-£59 a bottle from fine wine merchants. Everyone seemed to enjoy the evening, I know that I did and the wines gave a good flavour of the incredible range of wines and wine styles available from this wonderful province of Spain. Quentin gave the Association a quite marvellous tasting, to sample wines not available in the UK was a real privilege. He is a first rate tutor & his obvious love & knoweledge of his subjects is second to none & greatly appreciated by all those present. All the wines spoke for themselves – top notch !